How to cook rack of lamb recipes? Before we look at this question, let us clear up just what “a rack of lamb” is. 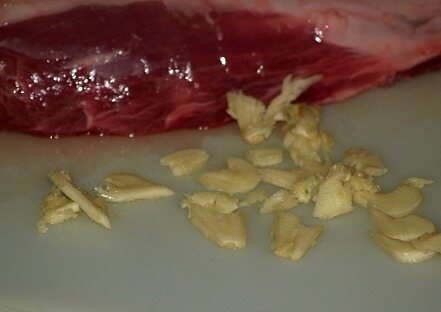 This cut comes from the rib section of the lamb. They are cut perpendicular to the spine. A whole “rack” contains seven or eight rib bones; there is one whole rack on each side of the lamb’s spine. The rack of lamb is one of the most extravagant and expensive cuts of the lamb. 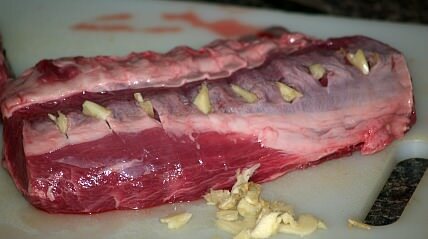 This section has rich marbled meat along the backbone and thick outer layer of fat. This cut makes a wonderful roast. When roasting, the outer layer of fat melts and bastes the meat giving it a delicious flavor. If you are preparing a roast allow two ribs for each person. 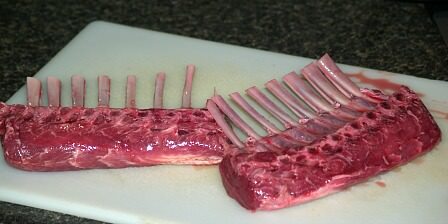 Often a rack is cut into individual chops before cooking. The most common seasoning for roasting a rack or the individual chops is salt and simple basic herbs. When I learned how to cook rack of lamb recipes, I thought lamb could not get any better. I was wrong! For a very elegant presentation I learned how to prepare a “French” rack of lamb. The rib bones are cut down to the main muscles trimming off all the fat and meat. This leaves about two inches of the bones exposed. Most butchers will do this for you or it is simple for you to cut. I buy lamb from Sam’s. 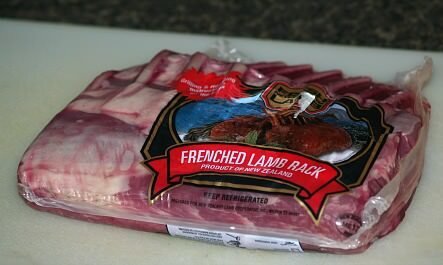 Quite often they have the French racks already packaged for sale with two in each package. The packages of French cut have two racks in each package; each rack having eight rib bones. These racks can be prepared together or separately. When serving both together, they make a very pretty presentation by intertwining the bones together. This is called a “guard of honor”. I learned how to cook a rack of lamb resulting in an even more elegant presentation. If you are entertaining, three or four racks can be joined in a circle for a “crown” roast of lamb making a beautiful presentation. The tips of the bones can be decorated with frilly “manchettes” making the presentation more elaborate. TIP FOR ROASTING: To prevent tips of bones from burning or browning too much, cover each bone with foil. TIP FOR DONENESS: RARE 250F degrees; MEDIUM 175F degrees: WELL DONE 180F degrees. This Greek recipe is seasoned with lemon and served with rice vegetable pilaf. Cut 1 inch slashes in the meat; insert garlic slices. Place lamb in a shallow pan; bake for 1 hour. Stir together the honey, brown sugar, lemon juice and salt in a small saucepan. Cook mixture over low heat until bubbly stirring until sugar dissolves. Remove pan from heat; stir in lemon rind, mint and walnuts. Spoon lemon honey glaze over lamb. Bake another 30 minutes until thermometer reaches 155F degrees or until desired doneness. NOTE: Baste 3 times during last 30 minutes. Cut unpeeled eggplant in ½ inch slices; sprinkle both sides with salt. Let eggplant stand for 1 hour in a colander over a plate to drain. Melt 2 tablespoons of butter in a large saucepan over medium high. Add mushrooms to saucepan and sauté 2 minutes; transfer mushrooms to a bowl. Rinse eggplant, drain and pat dry; cut slices into ½ inch cubes. Combine eggplant, olives,sun dried tomatoes, bell peppers and peas to the mushroom bowl. Heat remaining butter and the olive oil in the saucepan over medium heat. Add onion and sauté for 5 minutes; add rice and stir for 2 minutes. Stir the broth, water, remaining salt and pepper into the rice mixture; over high heat bring to a boil. Reduce heat, cover and simmer about 8 minutes stirring occasionally. Stir the vegetables into the pan; cook uncovered until moisture is absorbed stirring occasionally. Cook about 10 minutes longer; remove from heat and stir in the cheese. Pack rice mixture into a greased mold; let stand 3 minutes. Turn out onto a serving platter and arrange racks of lamb. Place lamb on a rack in a shallow roasting pan. Roast for 1 hour or until the internal temperature reaches 140F degrees for RARE. Mix honey with mint; spread over the lamb. LOWER TEMPERATURE TO 250F degrees; roast an additional 10 minutes to set the glaze. Remove rack of lamb from the oven; let rest several minutes before carving. Serve with mint jelly. Serves 2-3. Learn how to cook rack of lamb recipes with a marmalade. This recipe uses orange marmalade which can be made or purchased. 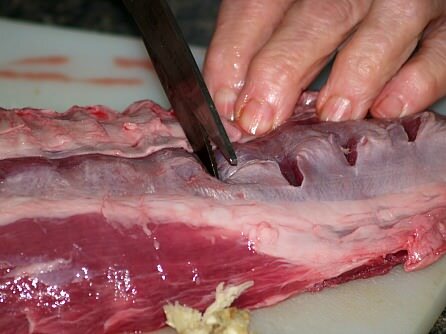 Insert meat thermometer into fleshy part of meat away from bone or fat. Place lamb fat side up on a rack in a shallow roasting pan; roast uncovered for 30 minutes. Mix marmalade with lemon juice; brush half on lamb. Roast uncovered another 30 minutes; brush with remaining glaze. Roast another 15 minutes for MEDIUM or until thermometer reaches 175F degrees. For WELL DONE roast 30 minutes longer until thermometer reaches 180F degrees. To serve add frills to the bone tips. Serves 2-3. *Demiglace; This thick brown sauce can be purchased or made. This rich flavored mixture adds a lot of flavor to this recipe. NOTE: Purchase the rack already “Frenched” or you can easily do it yourself. To “French “the rack of lamb use a sharp boning knife. Scrape off all the fat and meat from the rib bones down to about ½ inch above the eye of the meat. Lightly score the back of the meat in a criss-cross pattern. Combine the thyme, shallots, garlic, pepper and oil; rub into the surface of the meat. Let stand at room temperature for 45 minutes or in refrigerator for 3 hours. Place lamb on a rack in a shallow roasting pan; roast about 30 minutes for rare. CHECK TEMPERATURES ABOVE FOR DESIRED DONENESS. Let rack of lamb stand 10 minutes before carving. Add wine to roasting pan; boil for 1 minute to deglaze. Add demiglace and bring to a boil; scrape sides for any bits clinging to pan. Boil briefly to reduce; strain into a small pan; add herbs and any seasoning if desired. 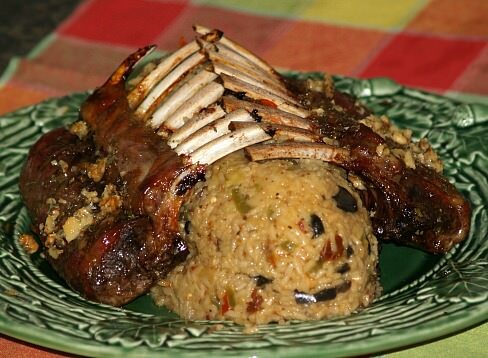 Learn how to cook rack of lamb recipes with an Italian flavor. This recipe has all the favorite Italian spices. Place lamb in a large shallow dish. Combine wine, steak sauce and garlic powder; pour 1 CUP of the marinade over the lamb. Cover REMAINING MARINADE and place in refrigerator. Cover lamb and chill for 8 hours turning over occasionally. Remove lamb from marinade placing it fat side us on a rack in a shallow baking dish. Baste often with refrigerated marinade. Serves 12.